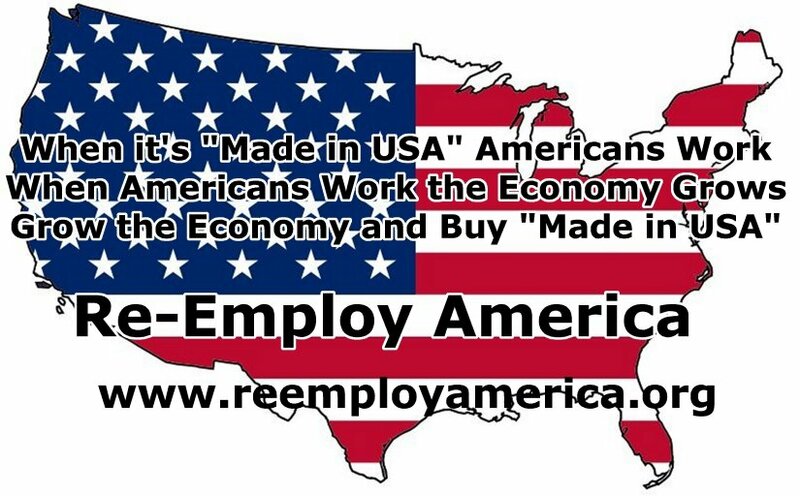 Marketing and Branding Re-Employ America - Employment & Economic Stability is our Future. Whether it's a nonprofit or for profit, marketing any organization and its message is imperitive for its growth. Selling a product, service or a message takes time, money and an audience to accept what you have. Brand recogniition is the most important part of marketing. T-shirts with a "Coca-Cola" or "Pepsi" logo in marketing, someone paid $30 for that t-shirt, which helps to pay for other marketing programs and the cost of the t-shirt (which was not "Made in USA"). As an organization our marketing will target people directly, politicians and corporations through constuents and consumers. You can help. Below are some printable downloads for marketing. Please download and print a few copies and share them with friend, family, neighbors and businesses in your area. One of our marketing programs which was initiated on June 28th 2012 was with Facebook. This marketing program was possible as a result of renting this website space from Go Daddy. We purchaced just over 172,000 impressions (the number of Facebook user pages) valued at $50. Other marketing oportunities through our Go Daddy purchase includes Google and Bing ads. The return on the investment of these advertisements will depend on future investment with these websites. We will have more printables coming. If you have a printable design you wish to share, please send it to marketing@reemployamerica.org. This image links to an Acrobat pdf, both the image and pdf fit a standard 8-1/2 x 11 landscape page layout. Coming soon; a 4 page brochure. Billboards cost from $500 - $3,000 for a four week display depending on the market plus the cost of printing which will be about $1,000 per display. We will have several different displays, some of which will be shared with manufacturers of consumer products. These range from small side and end banners to full wraps. Bus Wraps have a huge impact audience, and mostly captive as well. Depending on the size and location on the outside of the bus these cost $100 - $2,000 for a four week display. Prinding cost averages about $200 - $2,000 per display, according to size. Inside bus banners average $50 for four weeks with 100 banners and printing is about $15 per banner. Bus Benches have not been researched for pricing. Yard Signs are inexpensive, 2' x 3' four color signs printed on both sides cost $4,000 per thousand. These will likely be given to donors. We would like to provide one of these to every member of the House and Senate. Specialties such as coffee cups, t-shirts, key fobs, bumper stickers and window magnets are optsions as personal use items. Television and radio spots can be shared with manufacturers as well.